Age does change the human body - even the fittest body. Weakness in physical strength occurs due to decreased muscle volume. The growing inflexibility of tendons and ligaments weakens their ability to be agile. Bones become weaker in comparison to their youthful years thus increasing the risk of fractures. If steps are not taken to counter these changes, injuries happen. 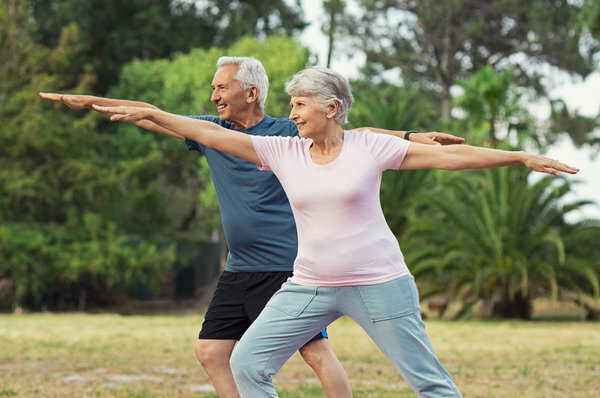 Older athletes who are fond of playing games such as tennis, basketball, golf, and softball, as well as running, are at a higher risk of injuring their knees and ankles. This article will take a look at ways to keep enjoying these sports while reducing the chance of knee injuries. Older athletes should have a consistent exercise program. This program should be at a moderate level and last about 30 minutes every day. Exercises should include walking, running, swimming or cycling to keep the heart in good condition. Consistency maintains a baseline of fitness. Injuries happen when there is a burst of activity following a period of being sedentary. To increase body strength, doing flexibility exercises such as yoga is recommended. Sufficient rest between sessions is also good. Stretching muscles allows them to expand and contract without snapping or tearing causing injury. Before engaging in the main exercise activity, warming up with a slower exercise for 5-10 minutes is a healthy way of starting. After completing the main activity, athletes should cool down with a more lower level exercise again for 5-10 minutes and rehydrate the body with water. This process will allow the athlete to perform at a high level without injury plus avoid body soreness and stiffness afterward. Do not delay seeking medical attention when there is a pain. Mature athletes with chronic pain due to knee injuries should visit an orthopedic doctor for a check-up to ensure they do not make their the injury worse. However, if their knees suffer from arthritis or other joint-related conditions, they should seek medical advice on the best way to proceed. Changing style or intensity of activities may be required. Excessive weight strains the entire body, in general, can also be a cause for knee injuries. Weight management through healthy eating habits should be a priority. Prevention is better than cure especially in knee injuries that take an extended time to heal in older adults. For more information on how to avoid knee injuries contact Dr. Dan Albright at 919-863-6808.